Until now, the biggest U.S. bank by employees had resisted deep job cuts, keeping headcount at about 265,000. In the second quarter, Wells Fargo was the only major U.S. bank to report lower year-over-year revenue, and it had the worst efficiency ratio, a widely watched industry metric. Wells Fargo is the only bank that hasn't significantly improved earnings after the administration's tax cut, according to one analyst. Wells Fargo Chief Executive Officer Tim Sloan is cutting jobs with the hope that he can save his own. Ever since taking over as CEO almost two years ago, Sloan has given top priority to move the bank past the fake-accounts scandal that garnered national headlines in 2016. Under Sloan, the bank has overhauled managers and its board, launched apologetic ad campaigns and revamped sales practices. But the U.S. bank with the most employees has, until now, resisted deep job cuts, keeping its headcount at about 265,000. That changed Thursday, when Sloan informed employees that up to 10 percent of positions — as many as 26,500 — would be eliminated over the next three years. In a town hall message broadcast to workers across the country, Sloan explained that Americans' adoption of digital banking and the firm's efficiency programs would result in layoffs and attrition. "The message was, we're trying to meet customer needs better by cutting staff by 10 percent, which is laughable," said Charles Peabody, an analyst at Portales Partners. "They're cutting expenses because they've got a revenue problem, not to meet their customers' needs better." Wells Fargo, the nation's third largest bank by assets, is struggling under the costs and business impact of its ongoing sales practice scandals. In September 2016, the bank said it was firing more than 5,000 employees it blamed for creating fake accounts under a high-pressure sales culture. But after disclosing that the bank opened millions of unauthorized bank and credit card accounts, other abuses were revealed, from bogus charges on pet insurance to the improper handling of wealth management and commercial clients. Thanks to "widespread consumer abuses," the Federal Reserve has limited Wells Fargo from growing in assets, which has stymied loan growth. As a result, Wells Fargo is the only bank that hasn't significantly improved earnings after the administration's tax cut, according to Peabody. 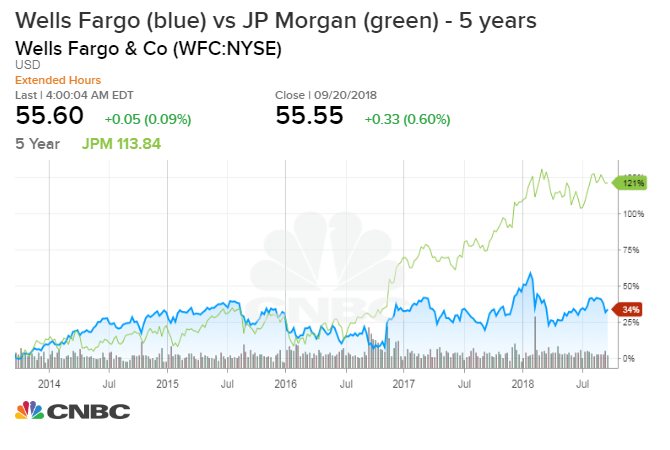 J.P. Morgan Chase, the biggest U.S. bank, has said it was opening branches in markets where it didn't already have a presence. When asked about the threat that technology poses to bank jobs, CEO Jamie Dimon has said he expected the headcount to remain steady because new positions are being created. Peabody figures that by the time the legal and regulatory scrutiny lifts and the bank is allowed to start growing again, the U.S. could be facing a recession. This leads him to one conclusion: Sloan's job is in jeopardy. "I think they're going to have a tough time growing earnings," Peabody said, "and Sloan is going to have a tough time surviving the next few years." The bank denied recent rumors this week that former Goldman Sachs executive and top Trump economic aide Gary Cohn was potentially replacing Sloan. Betsy Duke, chair of Wells Fargo's board of directors, said in statement that the CEO "has the unanimous support of the board, and this support has never wavered." After the cuts were announced, the bank was likely hoping for a boost to its stock. By the end of Thursday's trading, the shares had climbed just 0.6 percent. Meanwhile, as higher interest rates boosted the whole sector, J.P. Morgan shares ended the day up 0.9 percent.